"Well, lookit that. Another Taken wants you dead. Shucks. They'll never forget what you did to their king." 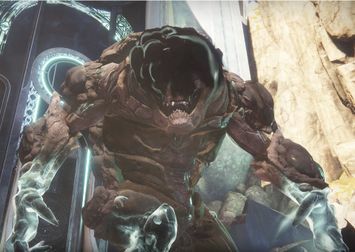 Morgeth, the Spirekeeper is an enormous, powerful Taken Ogre which serves as the enforcer of Riven's corruption in the Dreaming City, and the guard of the City's main tower, The Keep of Voices. It is the third boss of the Last Wish Raid. The boss encounter will trigger when someone collects a portion of Taken strength. Morgeth will rise and will start focusing the player/s with Arc blasts. To be able to damage the boss, player/s will need to get a ten stack on their "Taken Strength" buff, the ninth being the first "Taken Strength" that started the encounter. However, player/s that stack up three or more times per player will die, meaning that everyone should have two stacks each. While trying to do this, adds will continuously spawn and Morgeth will also continuously ramp up his strength. The speed of his strength increase will expand over time, sometimes by the "Taken Strength". In this boss fight, many Taken Psions, Taken Ogres, and a special Taken Captain will spawn. The Captain will drop Taken Essence, and only two Taken Essence can be present at a time. This is used to cleanse people of the debuff called "Taken Enervation" in which the targeted player is disabled from moving. However, people who are cleansed of it will lose all of their "Taken Strength". With the orb from the Eye of Riven, the player/s will need to use it to stop Morgeth from using all of his strength and team-wiping and to start damaging. It is recommended to use the bomb attack of the orb on the Ogre when Morgeth is at 90% strength, in which to maximize. Also, several Axion Darts will emit from Morgeth, able to kill most to all of the whole team. Repeat this cycle until Morgeth is vanquished and the player/s can move on to the next encounter. Note that the amount of "Taken Strength" will vary for each wave of each rotation. This could indicate that the two were made by the same Hive or Worm entity other than Oryx, the Taken King, Savathûn, and Xivu Arath.